The first of the Georgia Department of Transportation's 11 Major Mobility Investment Program (MMIP) projects, the $135 million-plus design-build widening of I-85, is being constructed by C.W. Matthews Contracting Company (CWM) Inc. to reduce congestion on the heavily traveled highway in Metro Atlanta. I-85 is being widened from two to three lanes in each direction for a 14-mi. stretch from I-985 to SR 53. Construction began in July 2018. 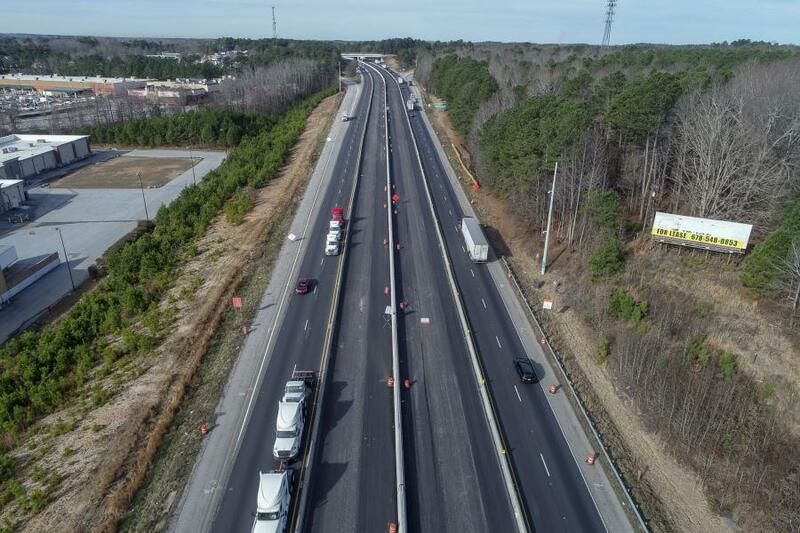 The new lanes, located in Gwinnett, Barrow, and Jackson counties, are being placed inside a grass median, along with a paved shoulder and median barrier. The work, to be completed in summer or fall of 2020, also includes the replacement of three overpass bridges and one mainline bridge, as well as the upgrading of signs, striping and the guardrail. "The I-85 widening corridor improvements will provide relief to motorists in this heavily congested area and is projected to reduce delay by 56 percent, add highway capacity for over 100,000 vehicles and improve safety in the area," said Natalie Dale, GDOT's spokeswoman. "Average daily traffic on this section of I-85 is 118,850 cars and trucks, making this a heavily congested route. "Various parts of the project elements, including the general-purpose widening and the bridge repair and replacements, were originally under design in the mid-2000s, but were shelved due to funding restraints," she added. "The project was reconsidered as a design-build project in the mid-2010s and added to the MMIP in 2015." The bridges being replaced are more than 50 years old. "The existing bridges are structurally adequate," said Dale. "However, because they are each 50-plus years old, they are functionally obsolete. When bridges are considered functionally obsolete, they may not have adequate lane widths, shoulder widths, or vertical clearances to serve the current traffic demand, or they could be occasionally flooded. The replacements will modernize these three bridges." The possible placement of noise barriers is being evaluated in accordance with GDOT policy and Federal Highway Administration regulations. Funding for the project was made possible by the passage of the state's Transportation Funding Act of 2015 (TFA). "[GDOT] has worked with the governor, General Assembly, partner agencies and local communities to prioritize a comprehensive set of projects to maintain the state's economic competitiveness and allow Georgia to remain the number No. 1 state for business," the project webpage states. "The TFA provided sustainable funding that will jumpstart backlogged maintenance and operations projects and fund the 11 major mobility projects, resurface and widen roadways, replace and rehabilitate aging bridges, and upgrade intersections with new signals. The state funding is allocated for roadway and bridge improvements only." CWM brought in Infrastructure Consulting and Engineering to help with the design for the project, which is proceeding on an accelerated basis. 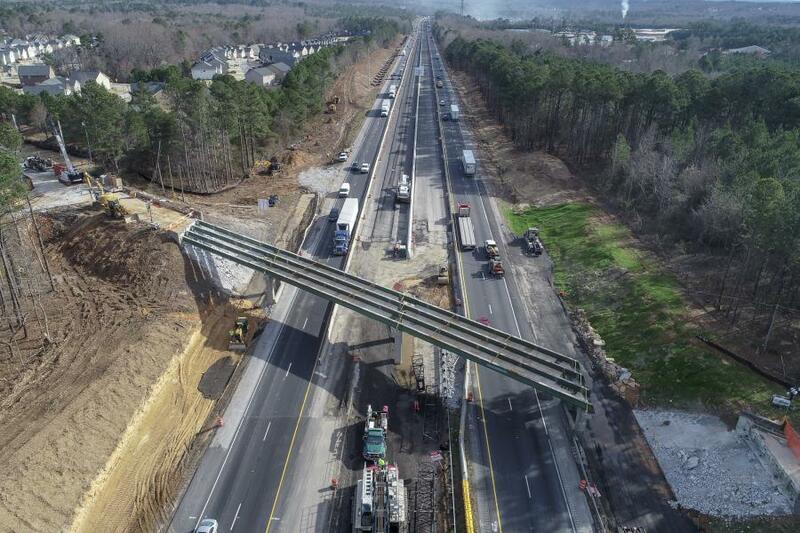 "The project adds about 18 new lane miles northeast of Atlanta and the challenge is the level of congestion on the interstate," said Darryl VanMeter, GDOT's assistant P3 division director and state innovative delivery administrator. "It's fairly straightforward from an engineering perspective. In general, the widening is taking place in the median, but the work ends up going on both sides to accommodate the full scope of it. We typically design for a 20-year lifespan, but with rehabilitation we extend that out. "Historically, in Atlanta, we've never been able to keep up with the increase in congestion," he added. "This is going to provide additional capacity and reduce delay by 56 percent between Hamilton Mill Road and SR 211. The northern part gets backed up for a long way. People don't realize how much wasted time is spent in traffic and kept away from productivity and economic gain." With construction taking place during the day, evenings, and weekends, traffic is being impacted. GDOT posts updates on night work, as well as other updates, at its website, www.dot.ga.gov. C.W. Matthews' crews, who are on schedule, recently completed the mill-in inlay of existing lanes that overlap with another ongoing project and started the demolition work for the Spout Springs bridge replacement. "We have a detour in place for local traffic," said VanMeter. "We're still reviewing the final design and drawing submittals for the final plans of the Jesse Chronic and Flowery Branch bridges." The 2019 construction season will focus on rough grading and median drainage, which has already started, fine grading, aggregate base placement, concrete median walls, asphalt paving, milling the inside shoulder, top soil removal, and relocating the temporary barrier wall. "Maintenance of traffic and keeping on top of incident management is important as every little break down becomes a huge backup," said VanMeter. "C.W. Matthews is using some innovative techniques to let people know that there's congestion ahead and that they are entering a work zone. This helps to protect the work zone. "There is not much room and you have to keep shifting traffic over a little bit to do the work on the other side," he added. "Strategic planning ahead of time is helping to ensure access for construction materials and equipment to the isolated work zone." The earthwork and site prep of the median area will encompass both sides of the widening simultaneously, with the new lanes being opened to traffic only when fully completed. Doing the work in sections helps to minimize the traffic impact. "There is a maximum length of distance they can go before they are able to have a refuge shoulder," said VanMeter. "We really don't have any utility issues on the interstate, but we have some sound barrier work to do on the outsides. We're also installing an ITS system, and we have a lot of borings going on right now to connect the cameras and message signs to NaviGAtor." In addition to traffic issue, recent heavy rains have slowed down progress. The work is being done day and night, with lane closures taking place to help with the bridge demolition. The bridge component is based on completing one bridge at a time for two of the overpasses. The mainline bridge has traffic switched to one side while the other side is being demolished and rebuilt. The overpass bridges — around 207 linear ft. in length, on average — will be rebuilt with two lanes in each direction. "We can't do two at the same time because the local network won't be able to sustain the construction" said VanMeter. "They are replacing the bridges in the same places, so demolition has to happen first. The main things that impact traffic are done at night." The new bridges, made of concrete, will be built following standard construction methods. The amounts for materials to be removed and brought onsite are being determined as the work progresses. Local and regional subcontractors have been brought on board for the project. CWM is using Etnyre asphalt distributors; Cat 279D and 226B skid steers and multiterrain loaders; Cat 235F, 335F, 349E, and 308E excavators; Link-Belt cranes — RTC8050 50-ton rough terrain and LS218 100-ton crawlers; Cat D3K, D4K, D6K and D6N dozers; Cat 930K loaders; Cat 12M2 motorgraders; Roadtec RP-190E asphalt spreaders; Roadtec SB-2500 and Weiler E-2850 material transfer devices; Cat CB-54, CB-64 and CW-14 asphalt compactors; Hamm HD140 and HD90 asphalt compactors; Cat CP-56B and CS-56 compactors; Hamm H11iXP and H11iX compactors; Roadtec FB-100 brooms; Roadtec RX-600 and RX-900 milling machines; and Wirtgen W250, W210, and W200 milling machines. CWM did not buy or rent any equipment specifically for the project as it is a local contractor and keeps the necessary equipment, for a variety of applications, in its fleet. The company purchases Cat equipment from Yancey Bros. Co.; Hamm, Entyre, and Wirtgen equipment from Tractor and Equipment Co.; heavy trucks MHC/Kenworth; pickups from Wade Ford; Link-Belt cranes from Atlantic & Southern; and much of its paving equipment from Roadtec. CWM has 15 Maintainer lube trucks that not only deliver fuel and DEF, but also help the mechanics perform preventative maintenance on a fleet of more than 740 pieces of mobile equipment throughout north and central Georgia. The company uses Cat's Product Link and its Visionlink interface to effectively manage its fleet. "This allows us to proactively manage preventive maintenance to ensure maximum uptime and productivity, as well as resale value," said John Fares, vice president — equipment division. "CWM relies on Caterpillar fluids and the scheduled oil sampling program and fluid analysis provided by Yancey Bros. Co's in-house oil lab."